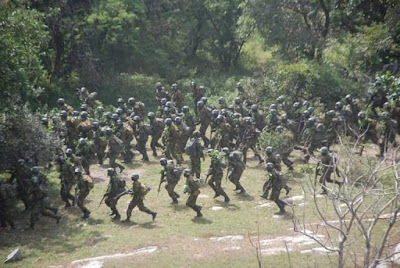 The Depot Nigerian Army in conjunction with Headquarters Nigerian Army School of Infantry (NASI) and Nigerian Army School of Artillery (NASA) conducted the final exercise for 77 Regular Recruit Intake between 25 and 29 September 2018 at FALGORE forest in Kano. After inspection of Quarter Guard by the representative of the Chief of Army Staff, he move from the Base Camp for the Battle inoculation which commenced, immediately after the Operational brief. The Commandant Depot Nigerian Army Major General Victor Ezugwu pointed out that, the essence of the Battle inoculation for the recruits is to build self confidence and remove fear from them as soldiers in a real battle.